Wow, we couldn't believe that in less than a day we not only reached 4000 "likes", we hit over 4500 "likes"!! Amazing! That means that we get to do something fun for not one, but TWO of our Facebook fans - give them an awesome Gidget II sewing table! Cyndi Stephenson from Vancouver, WA! Congratulations to both of you! We have all of your info and we'll be in touch shortly. We'd also like to say a big "Thank You" to all of our other fans for joining us this week! Don't forget, we'll be giving away an entire suite (chair, cabinet and cutting table) when we get to 5000 "likes", and we also do a fun little giveaway every Friday, so make sure you pop by and visit us often! CONGRATS CYNDI AND JAN!!!! HAVE A MOST WONDERFUL TIME WITH YOUR NEW GIDGET 11!!!!! Wooohooo I'm so excited!!! Thank you very very much for drawing my name. 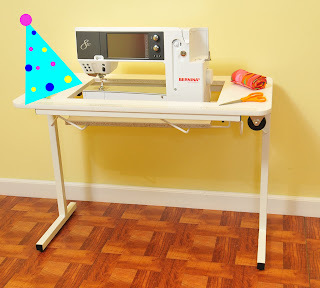 I absolutely love your sewing machine cabinets and really looking forward to having Gidget II!!!! Thank you again!!!! Congrats to both the lucky winners! Congrats to the winners. That's awesome! Congrats to both of you!!! Maybe better luck for me next time. Enjoy!!! Congrats Ladies, I will keep hoping for one of these.